When I sat down at my desk this morning to write and upload this post, I had no idea what I wanted to write about or what direction I wanted to go in. I hosted my sister’s hen party last weekend and I still don’t feel like I am back into the swing of things fully after having the whole weekend away, not to mention that I drank my own body weight in cocktails. But, the more I thought about it, the more I wanted to update you guys on the products that I use every single day. I like to do this post every now and again just, so I can keep you guys up to date on what I am loving and what I keep reaching for time and time again. First up, I will always start with my base. I know that hell of a lot of people like to start with the eyes, but it is just something that I could never really get into. To prep the skin, I will first go in with a layer of my Charlotte Tilbury Magic Cream to help hydrate my skin. Then, to help smooth out my skin and prep for the start of my makeup, I will go in with my Farsali Unicorn Essence. Initially, I thought that I was going to hate the Farsali Essence and it was going to be a fad product, but I honestly love it and my skin seems to really love it. I will admit that it is very pricey though and I do want to try out some other beauty oils to try and get a similar kind of finish. I will then go in with my primers. I always like to start out with my Charlotte Tilbury Wonder Glow. I have been using Wonder Glow for years not and it is honestly one of the best products that I have ever used, it adds glow to the skin and makes you look like your best self. Then, just in the areas where I need it I will go in with my Benefit Porefessional Primer. I tend to take the Porefessional around my t-zone and nose, where I can get pretty oily throughout the day. I only take a pea-sized amount of each of the products and I make sure that they are well worked into the skin. For foundation, it can only be my Nars All Day Luminous Weightless Foundation. I know that for the longest time I have been in love with the Nars Sheer Glow, but I feel like I have really upgraded. This foundation covers like a dream, applies flawlessly and is beautiful all-day long. Since I bought this foundation I haven’t been compelled to try out anything else. Plus, this covers all of my darkness and hyper-pigmentation so easily. I would say that this foundation is full coverage, but you can build it up to a very intense coverage, with a lightweight feel. For concealer and highlight it has to be the Tarte Shape Tape Concealer. I was going to boycott this product after everything that has happened with Tarte over the past couple of months, but I have these lined up on my shelf and I’m not rich enough to throw these out without a second thought. The consistency, longevity, blendability and look of the Tarte Shape Tape is something that I haven’t found with any other concealer. Then to cream contour it is my Bobbi Brown Foundation Stick in the shade Chestnut. The reason why I love the Bobbi Brown Foundation Stick to contour with is because it is lovely and creamy and never moves my foundation underneath. Then to set all of that into place I will take my RCMA No Colour Powder which is cheap and amazing all at the same time! For the eyes, I always keep them very natural on a daily basis, mainly because I don’t really have the time to do a fancy eye look. No matter what kind of eye look I am doing, I will always go in with Benefit Hoola Bronzing Powder to start with. This just helps to define the crease and bring some dimension into my eyes. Then on the lid I like to go in with a very light wash of MAC Woodwinked. To line my top waterline, I will take MAC Brun Eyeshadow and just apply it close to my lash line without it being too precise. I will then curl my lashes and go in with lashings of my Maybelline Lash Sensational Mascara and top it off using my Ardell Wispies. Then, I like to lightly fill my brows in, but still keep them nice and defined. I will go in to start with my Anastasia Brow Powder and map out the shape of my eyebrows ever so lightly. Then I will run my Anastasia Brow Gel through my brows to create a feathery kind of look by combing them in an upwards direction. Then to further fill them in and add some depth, I will use my Anastasia Dipbrow Pomade and use small hair like strokes. To finish them off, through the front of the brow, I will use small strokes using my Benefit Precisely My Brow Pencil to get a very natural look. Then, I will move back on the face. First up is bronzer and my personal favourite which is the Marc Jacobs Bronzing Powder. Since I first bought this bronzer, I have found it hard to reach for anything else because this is so beautifully buttery and smooth on the skin. Then to contour, I like to use my Kevyn Aucoin Sculpting Powder. I love the Kevyn Aucoin Sculpting Powder because it adds depth, without being too dark or ashy, but it is the perfect contour shade. Finally, to finish the face, I will go in with a touch of blusher and my favourite for an everyday basis is the MAC shade Melba. For lips, I again like to keep it nice and natural on an everyday basis. To start with, I like to go in with my trusty Charlotte Tilbury Lip Cheat in the shade Pillow Talk, which really is a cult classic product. I will lightly line my lips just to define the shape, then using either a lip brush or my finger, I will blend this out to make it look nice and natural. To top the lips off I like to use my old reliable Nivea Lip Balm. I know that Nivea is a touch boring, but it works for me and keeps my lips nice and hydrated, sometimes the classics are just the best. Anyway, that rounds off this blog post. That is everything that I will use on my face and a little into how I am using them. I love these products and that is why I opt for them every single day. If you want to see my full review on anything that I have mention, just click the link below to be taken to that page. Also, if you want to check any of these products your for yourself, I have left some links down below. Make sure to leave me a comment down below and let me know what some of your favourite everyday makeup products are! Such an an amazing drugstore product! I need to try more from Nars, looks like such a cool brand with so many good products! Nars as a brand is absolutely incredible! Nars is a great brand, their products are all amazing! I've never tried Maybelienne Lash Sensational but I hear great things so might have to give it a go! I honestly think that it would rival any high end mascara! I'm definitely going to try the Tarte shape tape concealer. Tarte products have always treated me well!! It is just such a great quality concealer, plus you get so much in the tube making it perfect for a daily basis! They are both just such good and reliable products! The Benefit pencils are so good, huh? I prefer the Goof Proof one though, I find it easier and quicker to work with! I think I am going to have to try the Goof Proof pencil, everybody seems to be recommending it to me! 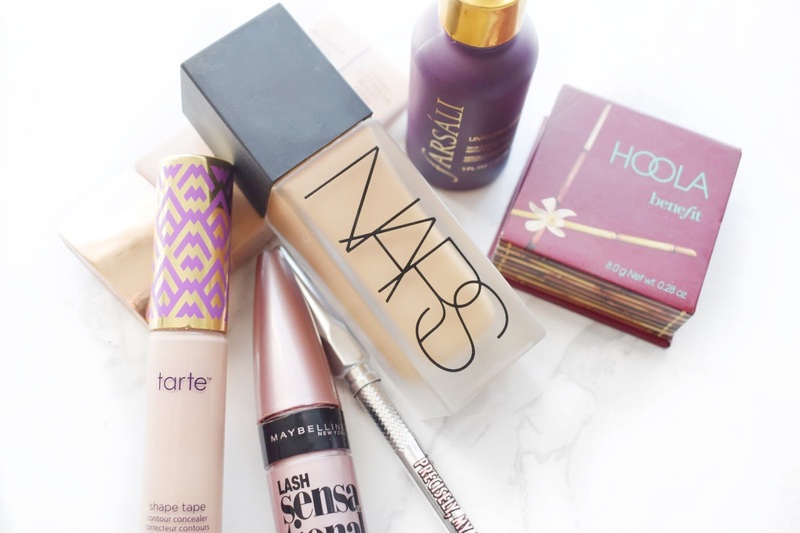 Nars is such a great brand, I use a Nars foundation pretty much every single day!